Purchase together The Paddlers Guide to Algonquin Park and the Algonquin Park Canoe Routes Map and the Canoeist Crest using this item code and SAVE. Imagine yourself paddling into the sunset. This sew on embroidered crest displays the silhouette of a lone paddler. Great for jacket, backpack or blanket. 2nd edition. Revised and expanded. 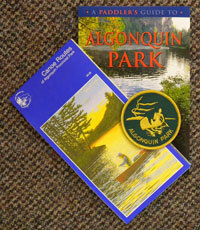 This is a guidebook to canoe trips within Algonquin Park. Contains trip descriptions, maps, personal anecdotes and other information. Kevin Callan. 2012. 172 pages. pb.